How many calories did I burn during jiu-jitsu practice? The fundamental principle of weight gain, loss, or maintenance is energy balance. Take in more calories than you expend and you’ll gain weight. Take in fewer and you’ll lose weight. According to the available nutritional research it really isn’t much more complicated than that. There are a number of formulae for determining your resting metabolic rate (RMR) but many people get stumped when it comes to figuring out how many calories they burned during grappling practice. To help estimate this value, exercise physiologists utilize the metabolic equivalents (METS) method. A MET is a unit of metabolic rate based on oxygen consumption. A single MET represents the metabolic rate at rest and is equal to approximately one calorie burned per kilogram of bodyweight per hour. This means you can find your resting metabolic rate in calories by multiplying your bodyweight in kilograms by one. So a 75 kg athlete will burn about 75 calories per hour at rest. Researchers have quantified different activities in terms of METS. This allows us to determine easily how many calories were burned per hour during that activity. Though no MET values have been determined for Brazilian jiu-jitsu, there are values for two closely related sports – judo and wrestling. Both of these grappling sports are rated from 6 – 12 METS depending on intensity. A lower intensity grappling practice will have a value of about six METS, a moderate intensity practice nine METS, and a high intensity practice 12 METS. The MET value represents multiples of the resting metabolic rate. So a six MET activity burns six calories per kilogram of bodyweight per hour and a 12 MET activity burns 12 calories per kilogram of bodyweight per hour. Once you estimate about how hard your practice was you can determine caloric expenditure. Let’s look at a sample problem. A 70 kg grappler practices for 90 min. The practice has a mix of activities but on average is of moderate intensity. 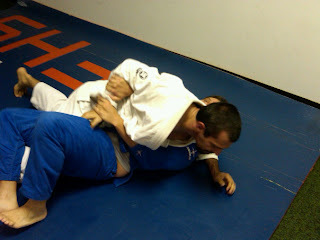 We use 9 METS to represent moderate grappling. So our sample grappler burned 945 calories in this practice. This figure can be used to help design an eating plan to accomplish weight maintenance, gain or loss. Obviously this method is subject to some error in estimation. Practices will typically be rated subjectively. To calibrate your scale consider six METS to be the pace of warm-up calisthenics, technique practice, and light drilling. On the other hand 12 METS would be sparring at or near competition intensity. Nine METS would fall somewhere in between. Think about your practice as a whole and assign an average value. An alternative method is to break up the activities in the class and determine calorie expenditure for each separately. The latter method will be more accurate but much more time consuming.